Social and news media have unfortunately seen a rise in two distinct toxic phenomena over the past year or so. The first is a steady stream of white women calling police on minorities minding their own business in public spaces, in dozens of cases including a Starbucks, a public park, swimming pools, streetcorners, and the common area of university housing. 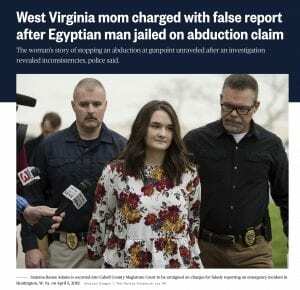 The second is a series of false rumors of child abductions, both across the United States and around the world; for more on this see my piece “Social Media-Fueled Child Abduction Rumors Lead to Killings” in the January/February 2019 issue of Skeptical Inquirer. For example in June 2018, Joshua Hatley, a Kansas man, posted a message on Facebook with information claiming a black woman attempted to abduct his child at a local Walmart. Police first heard about the incident not from the panicked mother or father but instead from concerned citizens who shared the urgent warning on Facebook over 11,000 times and wanting to know if their children were also in danger. Police investigated the attempted abduction and reviewed the store’s surveillance camera footage but were unable to find any attempted abduction at all. Detectives showed the footage to Hatley, who eventually admitted that he hadn’t personally witnessed the incident—that it was reported to him by his sister-in-law. As more and more questions arose, police became concerned about the woman photographed and publicly accused on social media of trying to abduct a child. For more on this see my blog on the topic. Another recent incident with lessons about eyewitness testimony, social media rumor, and racial bias has surfaced. 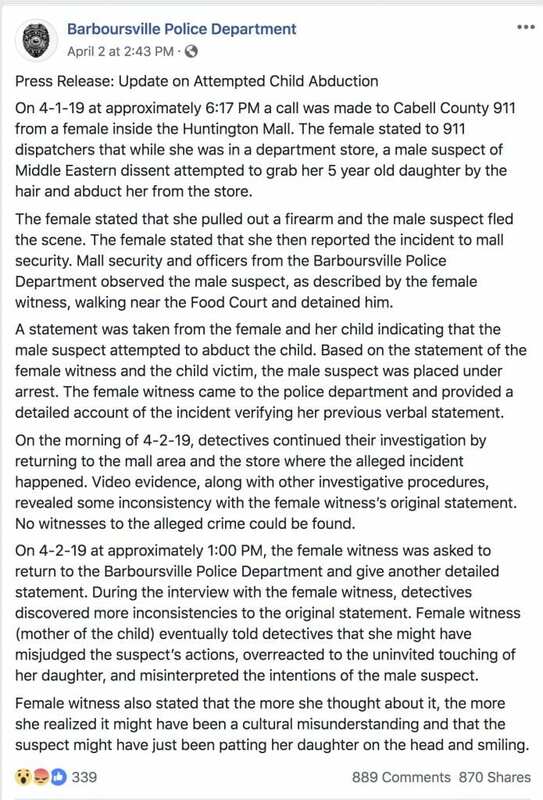 Santana Renee Adams, 24, a mother in Barboursville, West Virginia, called 911 to report that an Egyptian man tried to abduct her five-year-old daughter at a mall. Police, however, could find no witnesses to the incident, and there were inconsistencies in Adams’s statements about the incident when they interviewed her a second time. After being confronted by police with inconsistencies, Adams conceded that what she interpreted as an attempted abduction may in fact have simply been a cultural misunderstanding… He had maybe simply touched her daughter on the head—instead of grabbing it and throwing her to the floor as she’d described—in a display that, while inappropriate, was neither an assault or an attempt at an abduction. However that, too, was a lie. Zayan’s attorney, Michelle Protzman, reviewed security footage obtained from Old Navy and found “absolutely no evidence that Zayan touched the girl.” In fact Zayan and the girl weren’t even near each other in the store—and furthermore the mother was not seen pulling out a gun, as she’d claimed. Video surveillance showed Adams and Zayan walking out of the store, calmly and seemingly unperturbed, about half a minute apart and walking in opposite directions. Soon after that, however, Adams apparently—and retroactively—decided that the foreign man had (a few minutes earlier) tried to abduct her daughter, and called police. The accused man is an engineer employed at a local construction job and speaks little English. After Zayan’s mug shot and the accusations against him were shared widely on news and social media, the charges were eventually dropped.  “Instead of caring about facts and caring about evidence and the truth, I think the court of public opinion and social media don’t care about innocent until proven guilty and everyone jumps right on as soon as somebody makes an accusation,” Protzman said. So we have an innocent Muslim man who never even touched the girl being falsely accused of an attempted kidnapping by the girl’s mother. Why would anyone—especially a mother—make up a false accusation of attempted abduction against a total stranger? It’s not clear; the motivation could be racism, a misunderstanding caused by drugs or mental illness, or maybe just a desire to get attention and sympathy by casting herself as a heroic mom bravely brandishing a gun in defending her child from a stranger abduction (on social media she was hailed as a hero and as an example of why guns are needed when in public). Whatever the motivation, last week Adams was arrested for filing a false report, a misdemeanor. Most people who make false accusations are not charged; of those who are charged, most are dismissed (the Jussie Smollett case being a recent example); and of those that are not dismissed, the penalties are usually very light, such as a fine or probation. The congregation where I’m pastor has been learning a lot recently about systemic racism and how it’s expressed in the U.S. A situation like this one could easily become another “Emmet Till” incident where an innocent man is killed for being black in the wrong place at the wrong time. I wonder if it could also result in Mr. Zayan’s being fired from his work and possibly deported. There’s so little a person in his position can do once the false claim gets spread across social media.